SAPPHIRE Technology has just announced the SAPPHIRE HD 6950 Flex Edition, bringing a new level of gaming performance to the company’s unique solution for multi-screen gaming. A Dual BIOS feature allows enthusiasts to experiment with alternative BIOS settings and performance can be further enhanced with the SAPPHIRE overclocking tool, TriXX, available as a free download. Cooled by the award-winning SAPPHIRE exclusive Vapor-X technology, the SAPPHIRE HD 6950 FleX Edition has great thermal performance too – and quietly speeds through even the most demanding applications. The SAPPHIRE HD 6950 Flex Edition joins three other members of the FleX family, providing a choice of price and performance points for different applications and users, including the pioneering HD 5770 FleX Edition introduced last year. The recently introduced SAPPHIRE HD 6870 FleX was the first FleX series card to feature AMD’s second generation DX11 architecture including the latest core technology for streaming 3D content. It has 1120 Stream processors and 1GB of the latest GDDR5 memory, which together with clock speeds of 900MHz core and 1050MHz (4.2GHz effective) for the memory, make it a great performer for most applications. Its efficient cooler with three 8mm heatpipes and sealed dust resisting bearings keep the card cool yet running quietly even under load. For more cost conscious users, the new SAPPHIRE HD 5670 FleX delivers a cost-effective Eyefinity solution for increased productivity in tasks such as editing or business applications. 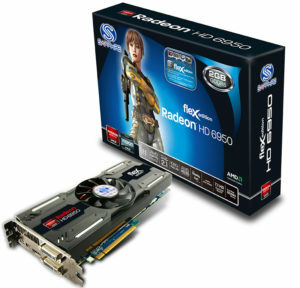 The SAPPHIRE HD 5670 is the highest performing DX11 graphics card that requires no additional power connector, making the SAPPHIRE FleX edition ideal for upgrading existing PC systems and providing additional monitor support. It has 400 Stream processors and 1GB of the latest GDDR5 memory, which together with clock speeds of 775MHz core and 1000MHz (4GHz effective) for the memory deliver excellent performance and great value. The SAPPHIRE FleX family all have on-board hardware UVD (Unified Video decoder), considerably reducing CPU load and delivering smooth decoding of Blu-ray™ and other video content for both VC-1 and H.264 codecs, as well as Mpeg files. The UVD can decode two 1080p HD video streams simultaneously and display HD video in high quality with Windows Aero mode enabled. Both of the HD 5670 and HD 5770 have HDMI 1.3a with Dolby TrueHD and DTS-HD Master Audio. The HD 6950 and HD 6870 FleX Editions have HDMI 1.4 which additionally supports Stereoscopic output. The SAPPHIRE FleX family is supported by AMD’s DirectX 11 WHQL certified graphics driver which delivers support for all of the key DirectX 11 level features required for new gaming experiences and acceleration of next generation high performance applications.